Saloca in Wonderland: 4 more books to inspire your creativity today! 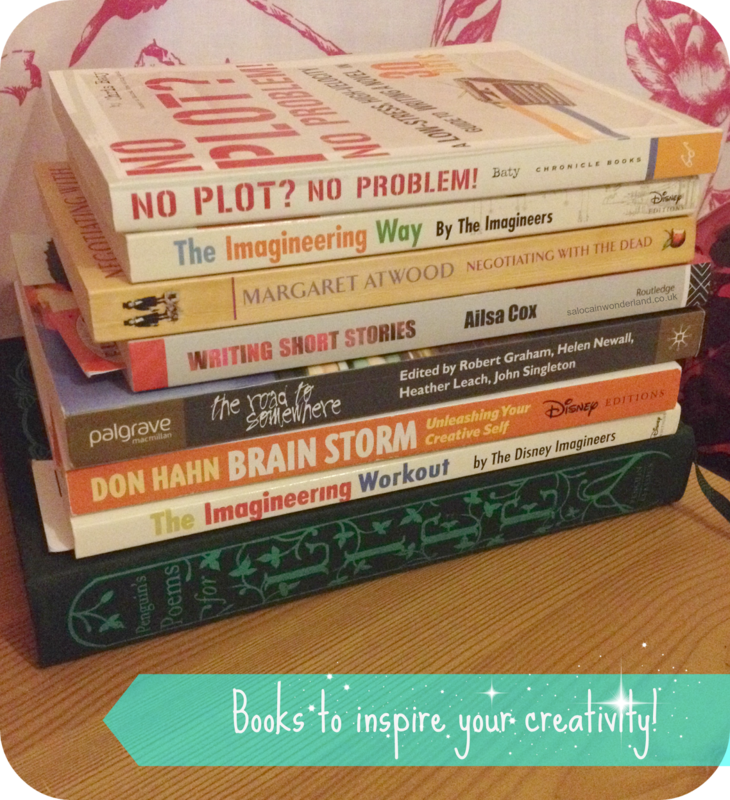 4 more books to inspire your creativity today! I have before me a stack of books. But this is no ordinary stack of books. No, no, no. These books, they’re pretty magical if you ask me. These books are the key to solving writers block, to inspiring creativity, to nurturing new ideas, to writing better blog posts and fending off the attack of the blank page. If you’re looking for some creative inspiration, whether you write blog posts or poems, short stories or to-do lists, baking a cake or solving a problem, we can all do it with a little creative flare. Blogging is a creative outlet, and it is writing. So, you might not have wrote a book on the shelves in Waterstones, but you are writing something, so you are a writer. From going back to the basics of writing to finding new ways to nurture those sparks of creativity, these books are going to help you out! This is part two, you can find part 1 here. One of the first books I remember buying way back when I was a little first year at university. This book became my bible over those years and I still cling to it now when I feel I am loosing that creative mindset. It starts at the beginning of the writers craft, guiding you through specific key elements of writing, helping you to develop your skills and writing abilities. It picks the flesh off writing and takes it down to the bare, basic bones and you can rebuild your little writerly self from there. Yes, I would recommend this for bloggers, a grasp of basic punctuation, paragraphing and layout will make a world of difference to your writing! Don Hahn is the producer of the Disney classics The Lion King and Beauty and the Beast. (Go on, which song popped into your head the second I mentioned those?) Whether you’re writing a novel, a blog post or baking a cake, creativity is there at every stage no matter what you might think. Though you might not feel like a very creative person, we all have a little creativity in there somewhere just waiting to be unleashed. Hahn shares some of his own unusual yet highly effective methods for unleashing the creative you and what to do with it once it’s out! This book always reassures me that I can do this and I am creative, I just get a little sidetracked sometimes! Disney Imagineers believe that anything can be achieved if you free yourself from the constraints of conventional formulas and stretch your creative capabilities to infinity and beyond! Just as you might go to the gym to workout your physical self, The Imagineering Workout aims to exercise your creative muscles. Stimulating your creativity, strengthening your ideas, and inspiring you in new and unorthodox ways, you will never consider yourself an un-creative person after this! Whenever I feel as though I am losing the fight against the blank page I open this book and tackle a creative exercise at random; it clears away the cobwebs and gets that fuzzy little hamster back on the wheel! I don’t know about you, but I for one find poetry to be pretty inspiring. No matter how many times I might read the same poem I will consistently come away with different thoughts and find new meaning between the stanzas. This book is a real gem, the selected poems are split up into varying sections about life, from birth to death and everything in-between, there is a poem for every occasion – and so, there is a poem for every problem you are facing. Reading the works of others gets me thinking about my own work, it gets the cogs turning, inspires ideas or a new approach to a subject. What the heck has poetry got to do with blogging though? Well, next time you’re struggling to write a post, go and read a couple of poems and tell me that doesn’t stretch your mind, you’ll have the post written before you know it! It also really helps improve the flow of your writing too! There you have it folks, a peek onto my creative shelf. I’d be lost without these books. Hands down, the inspire my creativity every time. They fend off writers block and slice down the blank page. Whenever I doubt myself or my writing these books never fail to convince me of the complete opposite it, that I can do this. We can do this. Have you checked out any of these books? Any others you can recommend I check out? Let me know in the comments below!